This year’s Golden Globe nominations are here, and there are a lot of movie and TV fans shaking their heads right now. 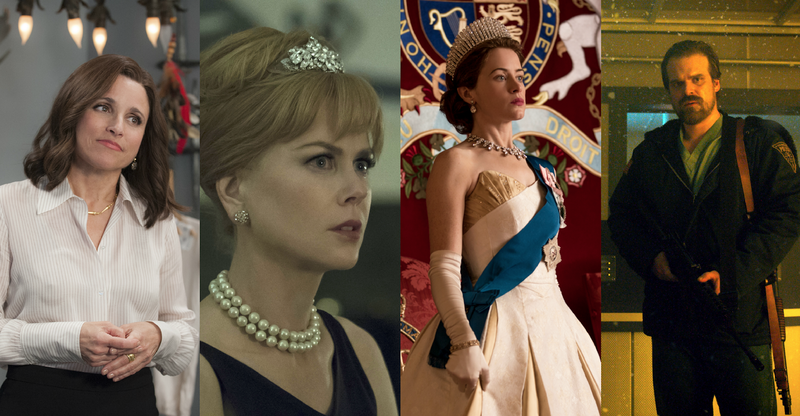 In some ways, it was a banner year for woman-led projects, with nods for Angelina Jolie’s First They Killed My Father, Nicole Kidman and Reese Witherspoon’s Big Little Lies and Hulu’s unendingly feminist The Handmaid’s Tale. On the other hand, Wonder Woman was snubbed completely. The nominations list is no more diverse than it’s ever been despite Get Out star Daniel Kaluuya’s much-deserved Best Actor nod, while Jordan Peele’s acclaimed direction and screenplay were both passed over by the HFPA. There were some other deserving newcomers, like Netflix’s Stranger Things, which got a nomination for Best Drama Series, as well as nods for Kidman, Witherspoon and Shailene Woodley for their acting work in Big Little Lies. And there were other developments that weren’t exactly unexpected, like Transparent being completely missing from the list in the wake of sexual assault allegations against Jeffrey Tambor and his subsequent sudden exit from the previously award-winning show. But like every year, there were plenty of deserving actors, films and shows that were snubbed. Kumail Nanjiani’s dramedy The Big Sick was loved by festival audiences and seemed sure to snag some nominations. It got none. Jake Gyllenhaal was passed over for his performance as Jeff Bauman in Stronger, lauded by critics as one of the best performances of his career. But none of this year’s snubs seem to sting as much as the absence of Veep, which has won three consecutive Best Comedy Series Emmys, but never a Golden Globe. With star Julia Louis-Dreyfus fighting breast cancer, leaving the show’s future a little bit uncertain, this is the year Veep deserved a nod more than ever. Were you surprised by this year’s nominations? Check out the full list here, and let us know in the comments.